28-mar-2012. A correction made in "All mods in one schematic" (tnx K4VKN). 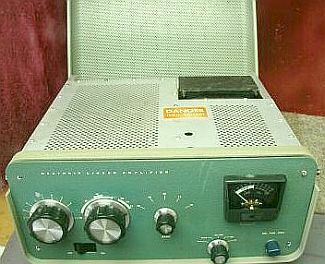 At a Dutch rally I once saw an open Heathkit SB-200 HF linear amplifier. 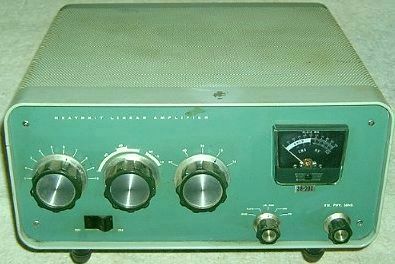 This model, first marketed around 1965, still features in many amateur stations. The open amplifier seemed suitable for modification to accommodate the Russian valves GU-43B, GS-35B or GI-7B to get more output. After a good cleaning and check-up all looked presentable again. The two 572B valves turned out to be as good as the pair I had from another amplifier. The cabinet is a bit like a suitcase, with a lid opening upwards. The internal height is 155 mm, but unfortunately, in the compartment where the two valves are horizontally mounted, the height is only 105 mm, insufficient for GU-43B or GS-35B without a lot of mechanical work. GI-7Bs would fit but I doubt these would produce more output than the originals. I decided to make such changes, possibly with new components as were required to make the amplifier fully serviceable. You may find my many experiments interesting and some of the resulting modifications useful. Ch. 1 contains modifications, which I believe to be good additions to the original design. Ch. 2 investigates the inclusion of the 160 m band, which was successfully tried but has not been permanently installed to date. Ch. 3 describes my thorough redesign, which also includes the modifications described in ch. 1. The amplifier currently is in that state of modification. Ch. 4 contains general information. 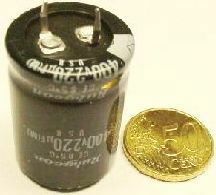 The original 125 µF/450 V caps (fig») replaced with 220 µF/450 V types. The six electrolytic capacitors in the HT supply looked a bit the worse for wear. Experience has taught me that they can loose as much as half their capacity with age. I replaced the original 125 μF/450 V units with a smaller, modern 220 μF/450 V model. These («fig) are so small that could be installed below the chassis. The space where the old elecrolytics had been would then be available, e.g. for another filament transformer or a bigger valve. If the Bakelite PCB were removed, the full cabinet height of 155 mm would then be available. The primary of the power transformer has two 120 V windings which are series-connected for our nominally 230 VAC mains. At an actual mains voltage of 226 VAC, the DC HT was 2150 V unloaded and 1900 V fully loaded. For best protection I like to use fuses. 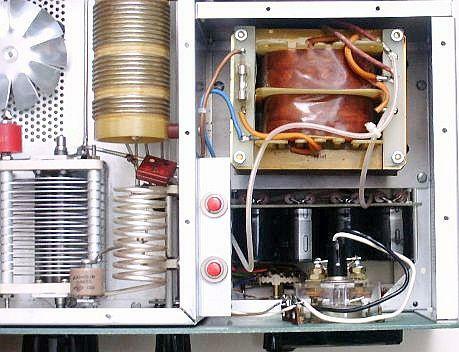 Note the 2 A fuse in the transformer secondary. There is 30 kΩ/10 W resistor across each of the six electrolytics. Between them, they dissipate approx. 26 W and had turned somewhat brown. They also noticeably contribute to the temperature rise in the cabinet. Because of the lower leakage current of the modern electrolytics each 30 kΩ/10 W resistor can be replaced by two 220 kΩ/1 W resistors in parallel. The series-connected rectifier diodes did not need replacing. This series chain is remarkable, as earlier practice would have a resistor and capacitor in parallel with each. With modern diode manufacturing processes this is superfluous. If you want to replace 8 × 220 µF/400 V caps with minor modification of the PCB, see the next pictures. Cut the track at the board, mount two caps on an extra PCB and move the red/yellow wire. After testing and finding the transformer OK, the amplifier was powered up without valves. With the meter switch in the HT position, there was no reading as two of the three 4.7 MΩ resistors had opened up because of old age or overloading. Replace them with resistors of better quality or by a chain of 1.5 MΩ or smaller resistors totalling 14.1 MΩ. It is good to know the HT fairly exactly. The reading can be calibrated against a precision voltmeter with HT probe if the circuit of fig a is used. A fixed resistor in parallel with the adjustment potentiometer limits the overload to the meter in case one of them fails. I used the circuit of fig b. (I happened to have a 4.7 MΩ HT resistor in the junkbox). A third important modification, which in my amplifier had been made by the previous owner, limits the primary inrush current due to the sudden charging of the electrolytic capacitors and slows the rise of the anode voltage. This protects the filaments and rectifier diodes and permits the use of a lower-current primary fuse. 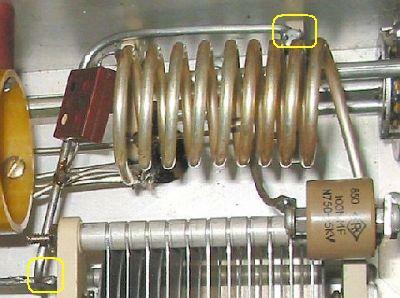 DANGER There are few, if any, fuse holders which let you change a fuse at the 2 kV level without opening the cabinet. Before working inside the cabinet, make sure the mains plug has been pulled and the electrolytic capacitors have been discharged; bleeder resistors may open up without you knowing it. Belt and braces please! 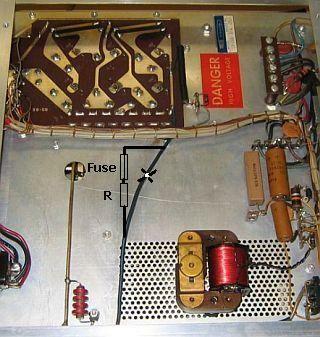 For first protection in all my power amps there is a fuse and a resistor in series with the anode feed. See diagram. That proved good practice in this amplifier. Within five minutes after first application of power, there was a flashover in one of the valves. The fuse had blown but the valve had not suffered. Under overdrive, the same thing happened. This time not only the fuse had blown but the 10 W resistor as well. Again, the valves were OK. Feel free to use a bigger resistor but I use these resistors as a second fuse and do not mind replacing them. 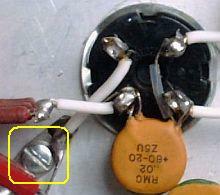 When, after a few days, during which the amplifier had not been used, I powered up, this fuse blew again. It seems that this often occurs with this type of valve after they have not been used for a long time. Once the amplifier has stabilised and is in regular use, this only happens infrequently. An extra 4.7 nF/3 kV bypass capacitor from between the fuse and resistor provides additional filtering. A 4.7 nF/3 kV capacitor in parallel with the original 1 nF from the bottom of the anode choke to earth increases the output on 80 m. C12 (20 nF), originally across the filament choke, would be more effective if repositioned as shown in the diagram. To avoid flashover in a new or a long time unused tube, it is prudent to prepare ("reactivate") it for his task. There are various opinions and solutions how to do it, but with a 572B it can be relatively simple. A DC of 40 to 50 V is sufficient for the tube to draw 250 mA as the grid is connected to the anode. Heat the tube 30 minutes with a filament voltage of 6.3 V. Then supply a "high voltage" of about 45 V and set the voltage to a current of 250 mA. With a new or good 572B a current of 250 mA should occur at 44 - 45 V. If possible use a current limiter, because during reactivate the current can increase suddenly so that continue monitoring could be necessary to maintain 250 mA. Usually I will not reactivate longer than an hour. Soon you will find out at which voltage a good tube drawn 250 mA, so you have an indication if another tube is better or not. All good used or new TAYLOR, WATERS and CETRON tubes that I could test were remarkably similar, as they were 250 mA at 44 Volts. The grounding of the grids is unusual and needs some explanation. In fig a, the grid with its long lead to earth represents a self-inductance which cannot be ignored. It, effectively, isolates the grid from earth, which may give rise to spurious oscillation. 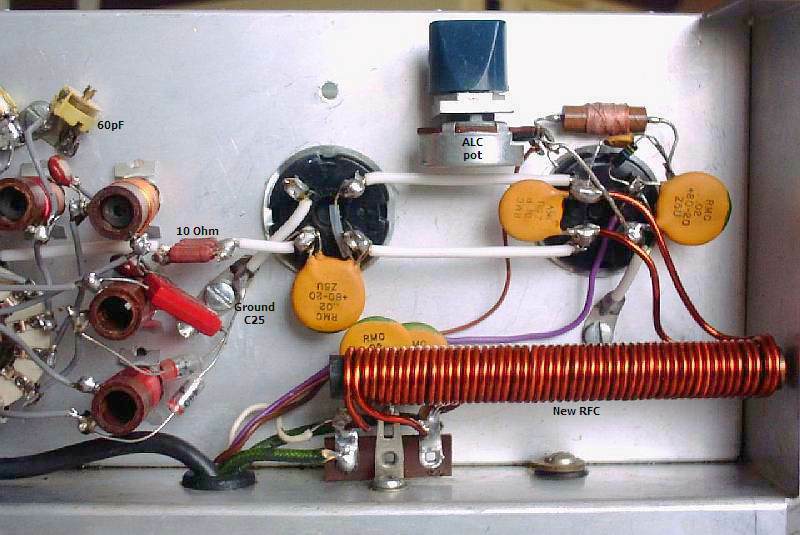 In the 30L-1 amplifier Collins have solved this by inserting a 200 pF capacitor in this lead. It, together with this self-inductance, makes a series-resonant VHF circuit, which prevents this oscillation. A non-inductive resistor of 22 or 33 Ω across the capacitor broadband this circuit (fig b). Some designers do not know why this series capacitor is only 200 pF and use a much higher capacity. Had Heathkit followed the Collins example, the circuit would look like fig c. In fact, they used circuit d, in which the 33 R resistor does not have the damping effect but does provide some DC inverse feedback, which tends to improve power sharing between two unmatched valves. Collins chose a 200 pF capacitor for older types of 572B valves and I doubt that would be optimum for more recent 572Bs. My SB-200 amplifier with Cetron 572Bs uses the circuit of fig e with 1–1.5 nF per valve. The amplifier remains stable and its output, measured with a Bird 43 meter with 2.5 kW insert and a Bird 50 Ω dummy load, is as in the table below. This output is more than I expected. At the full mains voltage an output on 80, 40 and 20 m of almost 800 W can be expected. The plate off-load voltage then is 2100 V; on average voice SSB it is 2050 V and 2000 V during a series of CW dots. The SSB and CW output exceeds the datasheet values! Increasing the grid decoupling capacitors can have even more output but then the recommended plate current is exceeded. It also considerably changes the input impedance of the 572Bs and it becomes more difficult to adjust the input circuits for an acceptable SWR. The original 200 pF grid capacitors (fig») were a bit under dimensioned for the currents they must pass. During experimentation one of them shorted, affecting the 120 V bias supply. The remaining bias was then inadequate to fully suppress the plate current during reception. In my amplifier I have installed more rugged types, old-fashioned tubular ceramics rated at 1.5 nF/1 kV. Install them with the shortest possible leads as close to the valve socket as you can. It is shown in the diagram how the ground connection of C25 has been shielded from the ground of the tube sockets. (This is common to a lot of amplifiers.) A RF current from the tube via the capacitor to the tube sockets must overcome many barriers or detours and reaches finally the sockets in the screened socket box. That caused is my belief instability and undesirable oscillations. 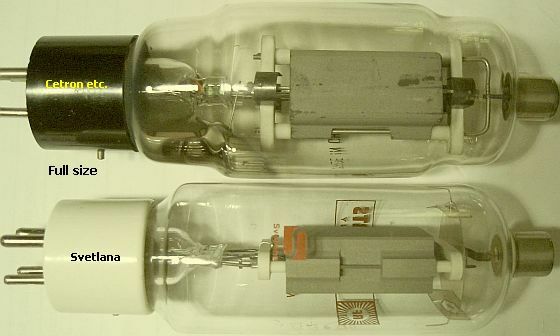 A shorter solid direct connection forces the HF current from C25 in one direction straight to the tubes. 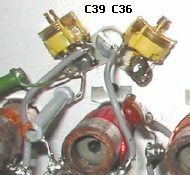 It is best to ground the frame of C25 to one of the valve sockets (or a common earth) with heavy wire or, even better, a piece of coax. See the coax connection in my FL-2100Z article. 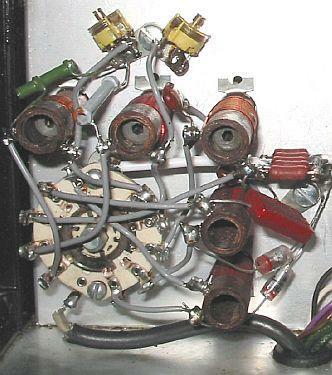 C26 was grounded at the front panel with the band switch and that has been changed to a heavy wire to the frame of C25. All is shown by the outlines (red, yellow) in the pictures. This modification improves the stability (with less parasite oscillations) of the amplifier. A second modification is the protection of the meters against burnout resulting from stray RF or some fault condition. A capacitor and a pair of inverse-parallel diodes shunt each meter. A rectifier bridge may be used in lieu of discrete diodes. 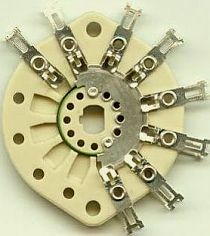 This connector has been replaced by a BNC socket, which does fit the existing hole. Bayonet connectors facilitate experimentation and I use them wherever possible. A method of parasitic suppression is the insertion of RF current (hairpin shaped) obstacles (dampers) at right angles to the probable flow of the parasitic currents. This method can be used up to frequencies of several 100 MHz without noticeably reducing fundamental power. The main function is to provide a high impedance path in series with other (tank) circuit elements. However such method can be used only where the fundamental and parasitic frequencies are sufficiently far apart, so that excessive resistive losses of the fundamental frequencies are avoided. The circuit should have a L/C ratio as low as practicable and be suitably damped to give a broadband effect. Damping can be achieved by paralleling the hairpin circuit inductor with a non-inductive resistor and by making the inductor from resistive material. A mat surface rather than a polished surface may provide sufficient surface resistance. The resistive component needs often be no more than a nickel alloy wire/strip or tinned copper wire/strip with a DC resistive valued of a fraction of an ohm. 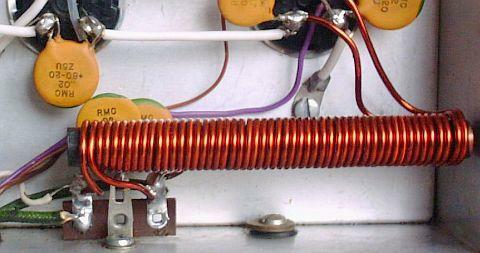 The suppressors (fig») in this amplifier are small coils PC1 and PC2 respective paralleled with a 47 Ohm resistor. They prevent parasitic oscillations in the VHF region. The value of a resistor is not critical (22 -100 Ohm) but it needs to be non-inductive and has the purpose to broadband for VHF. One of the resistor leads looked ready to break. I undid the coils and measured the resistors: nominally 47 Ω, they had increased to 82 Ω. I replaced the stoppers with the ones shown in the images, which I had previously found more effective than the original design. A standard "design" was developed after much trial and error and consists of 12 cm wire shaped in a "U" with a distance of about 2 cm between the "legs". However cut 13.5 cm and use 1.5 cm to wind around the legs of the resistor and solder it. Use standard 1 - 2 mmØ (13 gauge) tinned wire because this introduces additional losses on VHF ensuring maximum functioning of the trap. 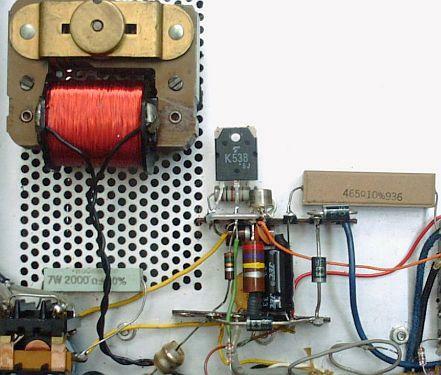 The 56 Ω/2 W composition resistors (I happened to have that value) are in this amplifier shunted by hairpin loops made of Teflon-insulated stranded wire, which is easy to bend but then holds its shape but you may use standard tinned wire. 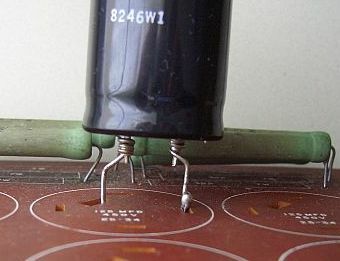 The vintage non-inductive (carbon composition fig») resistor is hard to find and a modern equivalent are 3 W brown Philips in values from 22 to 470 Ohm. 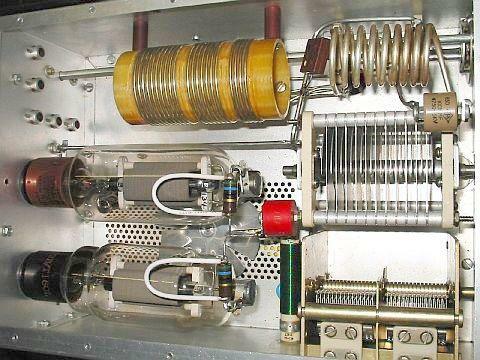 After changing the grounding of the grids as described, the input circuits were tuned by adjustment of the coil cores and capacitors for best SWR in the centre of each band. Do not forget though that all depends on how the wiring is dressed. 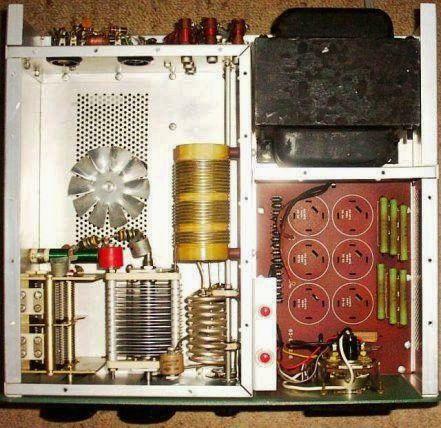 You may find different values for your amplifier, especially at the higher frequency bands. Using 100 pF ceramic trimmers makes things easier. They can handle the 100 W drive without problems. A good compromise is to be found for the 10, 12, 15 and 17 m bands. If you adjust for a 15 m SWR of 1.2, it will be 1.7 on 17 m and vice-versa. An average of 1.4 for both bands is a good compromise. If you want to operate above 28.5 MHz, the SWR will exceed 1.5. A separate circuit would be required to improve on that. If you can achieve an SWR of 1.0 on 10 or 12m, the output increases by 30–50W. Where an input circuit is only an L-network, the length of the coax from the driver and stray capacity may affect the SWR. Having tried various circuits for 10 and 12 m, all of which did work, I still was not happy. With a properly dimensioned pi network, a 1.0 SWR should be possible. The self-inductance of L1 actually was too small and has been increased to approx. 620 nH. Replace the three turns with six turns of 1mm wire. If wound on a 9 mm drill bit, a tight fit on the coil former results. Secure with a drop of super glue. Note that C1 has been replaced by one of 100 pF. Careful tuning now achieves an SWR < 1.2 on both bands, and 1.0 on either band. On 10 and 15 m moving the cores in the coils does not have much effect. That is because the stray capacity of the layout and wiring is excessive. By replacing the L-network by a pi-network, 2 × 150 pF on 15 m with a coil in between, the stray capacity becomes part of that circuit and the SWR is not so much affected by the coax length. C36 then must be 150 pF less the stray capacity. L2 should be about 750 nH, ten turns of 1 mm wire replacing the original five turns. If you also want to revamp the 20 m circuit, use the original 20 m coil on 15 m and rewind the original 15 m former for 20 m. By adjusting the core of L2 and C36, an SWR < 1.3 can be achieved on both 15 and 17 m. I found a good compromise with the original C36 = 76 pF. It is quite a job but I believe it to be well worthwhile if one input circuit has to serve on two bands. The easiest way is to tune for a 1.0 SWR in the centre of the 15 m band and then, on 17 m, to adjust C36 for an SWR < 1.5. The wire and core of the filament choke and the 10 Ω feed-back resistor got quite hot when working on 80 m. I suspected that the self-inductance of the choke was too small. That proved true – it was only 10 µH. From my experiments with the input circuits and some calculations regarding the values of the tuning capacitors found, I concluded that the real part of the input impedance of the two valves together is 110–135 Ω. A self-inductance of 10 µH at 3.5 MHz has a reactance of only 220 Ω, which shunts the 135 Ω input impedance of the valves. Even on 40 m is the choke a bit small. A considerable fraction of the drive power is absorbed by the choke. The 10 Ω-feedback resistor is no longer small in comparison to the total input impedance and also got hotter than it should. I replaced the choke by a homemade one of 20 µH, 2 Χ 26 turns of 1.8mm (~13 gauge) wire on an AM-radio antenna ferrite rod, 100 mm long and 9.5 mm diameter. The diameter of the wire is not that critical and I used enamelled wire from a discarded supply transformer. The unwarranted heating no longer occurs. On my 226 VAC mains (it drops to 221 VAC under full load), the filament voltage measured at the valve pins is 6.14 V, good for long valve life. If 160 m operation is contemplated, an even larger filament choke, wound end-to-end on a 125 mm or longer ferrite rod, would help. The RFC may be wound on a ferrite toroid but the inductance of the windings should be at least 20 µH. The new choke requires retuning of the input circuits for best SWR. The difference is greatest on 40 and 80 m. Note that C32 (310pF) of the 40 m circuit has been replaced with 240 pF and that C30 (470 pF) of the 80 m circuit must now be 440 pF. Not a bad result for an old nag, is it? Actually, on 12 m with the 15 m output tank selected, and a proper in circuit 700–750 W output could be had but with the 15/17 m input circuit the input SWR would be excessive on 12 m.
Because of voltage doubling in the HT supply the plate voltage and output are very sensitive to the mains voltage of the moment. It can make a difference of as much as 100–150 W, occasionally even 200 W in RF output if the mains voltage dips because of the load of the amplifier. With the 10 Ω feedback resistor in place, there was no longer a need to calm the valves by series-tuning the bypassing of the grids by means of small capacitors. Besides, the 1500 pF ceramics I had installed got fairly hot. That being suspicious, I replaced them with old-fashioned of mica 10 nF. Because the wiring between filaments is fairly long, I installed a 10 nF capacitor across the filament end of the choke where there originally had been a 20 nF capacitor, the latter having been moved to the input before. Though my Ten Tec Corsair II transceiver is capable of switching the relay from the -120 V supply, most current transceivers are not. The diagram («fig) shows a fairly simple way of switching with low voltage and current. On first sight this seems a strange circuit. Three rectifier diodes and two electrolytic capacitors create –12 VDC from the 6.3 VAC filament supply (it will also be used for the extra 12 VDC fan mentioned in Ch. 4). To do that, the centre tap of the transformer filament winding must be cut from the chassis. 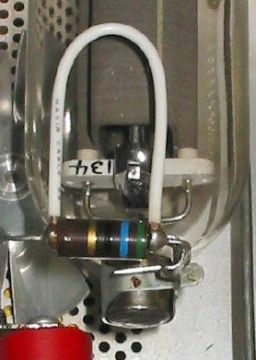 The two left-hand diodes re-establish centre grounding for the tube filaments. Because these diodes pass the cathode current of both valves, they must be rated for 1A minimum but preferably 3 A. The +12 VDC is earthed. R16 must be disconnected from the output connector ANT RELAY and is connected to the additional reed relay. A new 4.7 kΩ resistor is then connected to ANT RELAY. 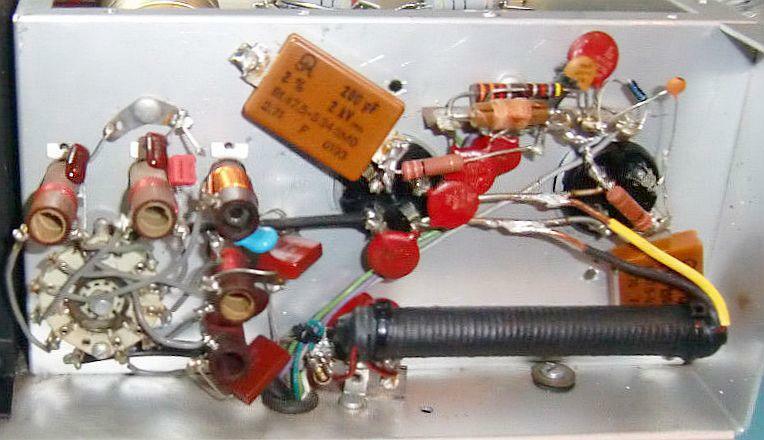 With this modification, the transceiver needs to switch only a few mA from a negative supply. (T1 = 20 V/ 50 mA NPN). It was the intention to make this SB200 amplifier suitable for 160 m, using a Pi-L anode circuit and a separate input filter. As you may have noted, the original SB200 loading capacitor (C28A+B) is not a receiving type with the narrow plate spacing, but it has wider spaced plates. This makes it possible to use this capacitor in a Pi-L filter. However, although the SB200 loading capacitor is suitable for a Pi-L filter on 160 m, the problem is that the combined self-induction of all the tank circuits is too small for a filter of this kind. It is possible to change this situation, but that would be quite involved and I decided not to take this route. Instead two Pi-filters for 160 m were made and tested (see Fig a and Fig b). The tank circuit in Fig a has a Q of approximately 5. This circuit has the advantage that only an extra fixed capacitor (1800 pf) is required in parallel with the existing SB220 loading capacitor, and uses the total capacity of the 80 m tuning capacitors (C25+C26). The Q of the tank circuit in Fig b is about 10 and it requires an extra 250 pf capacitor in parallel with the 80 m tuning capacitors (C25 + C26) to tune to 160 m.
Switching the SB200 input circuit for 160 m requires only a small relay, but a heavier one is needed to open/short an extra coil (or switch in an extra capacitor) so that the SB200 tank circuit resonates on 160 m.
To make the SB200 tank circuit resonant on 160 m, an inductor wound on a toroidal core is switched in series with the 80 m tank coil. Because the toroidal core has no external field, it can be conveniently mounted under the chassis, near the opening to the loading capacitor. 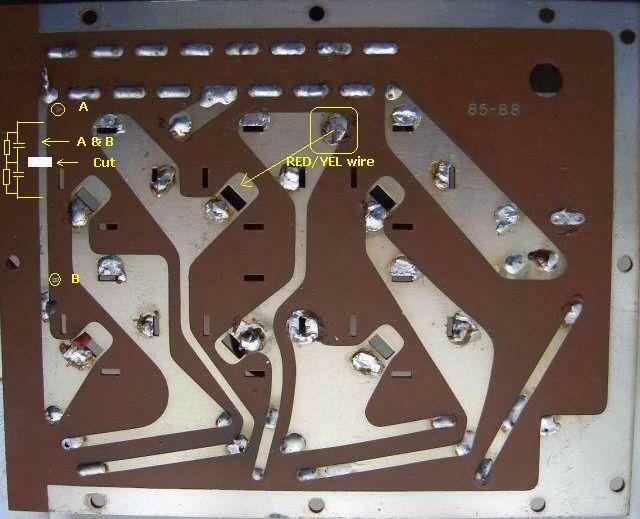 To carry out this modification (see Fig a and Fig b) the only thing required is to break the connection from the existing SB200 loading capacitor (C28A/C28B) to the band-switch and insert the extra inductor (L) between the contacts of a heavy duty relay (Rel1) at this point. Note that the circuit ideas described above are in a preliminary state and have not moved beyond testing at this stage. When one does a lot of experimenting, it is important to keep an open mind and not to forget or skip over things. For example, when I first looked at the original SB200 anode choke, I thought it was rather small for use on 160 m, and that I should measure it one day. Unfortunately, that day did not come until the one when I tried my modified SB200 on 160 m and found I could not to get more than 150 W RF output on 160 m, contrary to my previous experiences with these valves. I then spotted again the small anode choke (which only measured 50 µH) and remembered that too small an anode choke results in low RF output. When I hooked up a second anode choke in series with the original one, the SB200 output on 160 m went up to 500 W! This was not bad, considering that the line supply was ± 221 VAC and on 80 m only 600 W was produced. Moreover, I was actually using the 80 m input circuit on 160 m, with a tuner to get a 1 : 1 SWR on 160 m.
I also noticed that the grid current on 160 m was less than on other bands and suspect that this results from the filament choke having too little inductance (10 µH) for 160 m.
On the internet, there is some information on improving the SB200 which advises changing the LC input circuit for 80 m into a Pi-filter. Although I also prefer the use of a Pi-filter for a linear amplifier input circuit, I determined that the 80 m LC input circuit in my SB-200 is working properly, with the input SWR at the band edges being 1.2 : 1. As the 160 m band is quite narrow, an LC circuit should be suitable for that as well. Following this route, modifying the SB200 input circuit for 160 m can be simplified by using the 80 m inductor as part of the 160 m inductor (see fig» above). How this will work in reality still has to be tested. Note that the 13 µH inductor used in the tank circuit modified for 160 m can be made using an Amidon T200-2 (or larger) toroidal core, wound with 32 to 33 turns. As mentioned in the introduction, I got this amplifier to experiment without having to do too much mechanical work. Because I had previously modified another amp with 3 × 572B valves and using a directly grounded grid design, I finally changed this SB-200 according to the schematic given here. The components have been numbered with their original numbers. As much as possible I have used the original components, the extra parts have not been numbered in the diagram. The modification is quite involved, as the ALC circuit as well as the anode and grid current meter circuit needs to be changed to fit in with this modification. Although the diagram looks quite complex, it can be build rather compact. With the new design any modern set can be used to drive the amp, as the switching only requires + 0.7 V at 200 µA. 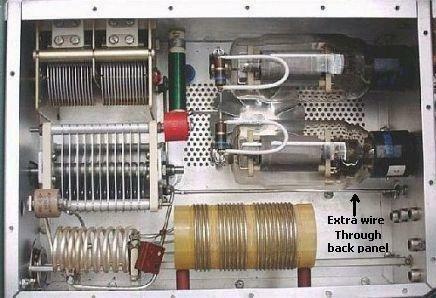 The HF grounding is much better using the grounded grids. The valves are switched off with a positive voltage through the coil of the tx/rx relay. The cathode (filament) is switched to ground through 4 × 3 Amp diodes when both transistors earth the relay. This series of diodes creates the negative grid voltage of approx. 2.8 V. The idle current can be changed by adding or removing some of these diodes. Please note that the polarity of the components of the 120 V secondary has been reversed compared to the original design. I did not have a 10 Ω/10 W resistor so I used in the input circuit five 47 Ω/1.2 W units («fig) in parallel. This works but is borderline, it is better to use a 10 W resistor. The mosfet K538 was discarded from a PC power supply and the NPN transistor can be any universal type, like a BC547. 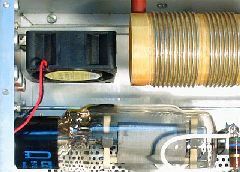 The 330 Ω resistor between R15 and the meter switch is used to scale the meter. 500 mA indicated on the meter relate to 100 mA grid current, 400 mA is then 80 mA, etc. In my SB-200 this 330 Ω resistor, in combination with R15, turned out to be on spot, otherwise a trim-potmeter can be used. On the left you can see an EURO socket for the line-power inlet, on the right the BNC connector for the input of the amplifier. The new ALC circuit delivers a voltage between 0 and –35V. A new and smaller capacitor has replaced C3. The over-voltage protection (SG) looks like a small neon-bulb and is made by Siemens. During testing everything went fine and this protection has never blown, but to be of the safe side I have permanently mounted it (bottom-left corner in the photo). 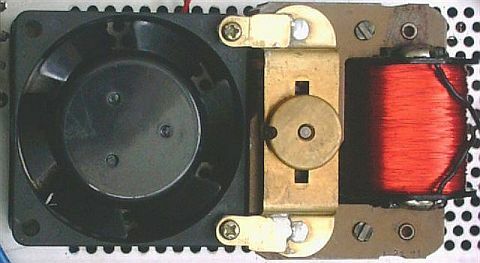 All components have been mounted on the mounting tab, which has been moved from the valve bases to the bottom, close to the fan. The airflow keeps both transistors cool. At the back, where the mounting tab used to be, I have made an angle bracket, which holds the ALC potmeter. As you can see (fig») this modification has created some more room. The unused pin of the right-hand valve base has been used to mount the other components of this circuit. 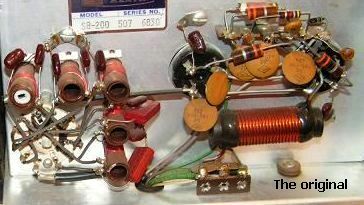 Because a number of linear amplifiers available for the radio amateur are fitted with 572B’s and are using 2700 VDC supplies. Therefore I increased the anode voltage using a 230 VAC/0.6 A transformer. As mentioned before this transformer can be mounted in the space previously occupied by the old electrolytic capacitors. A suitable unit I had lying around fits easily in this space. This second transformer is wired in series with the 800 VAC of the voltage doubling circuit. Using a switch one could choose normal or ‘turbo’ output power. The higher anode voltage requires the capacitor-bank to be made out of 8 × 220 µF/400 V units. A test of this higher anode voltage, using an external power supply, showed an extra 125 W in ‘key-down’ and about 200 W PEP extra in SSB. While this is not too spectacular, the negative grid current reduced considerably and this means that the bias of the valves was improved. Measurements after adding the second transformer have shown at 2250 VDC (key-down and optimum supply line-voltage): 850 W output on 80,40,20,17,and 15 meters, 750 W on 10 m and 725 W on 12 m. Using SSB the average voltage was 2550 VDC. This means, using an efficiency of 62%, 950 W PEP output. Sending a rapid series of dots showed 2450 VDC. Using 50 W drive I got 600 to 650 W out of my ‘turbo charged’ SB-200. Unloaded anode voltage was 2950 VDC. 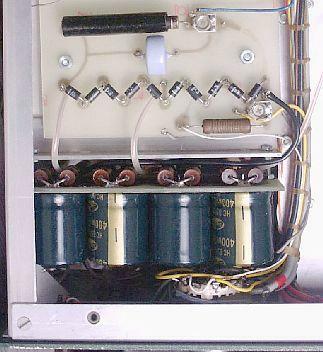 Input SWR did not vary much and both loading and tuning capacitors required only minimal adjustment. The output is more stable and doesn’t depend as much on the supply line voltage as before using the higher anode voltage. It is best to not exceed 800 W carrier output. Using 2 new valves and 221 VAC line input the output in key-down condition is 800-900W. If you want to add or optimise a input circuit it is best to use the C-values giving in the table. Starting with a fixed input value, experiment with Lx and Cx to get the lowest SWR. Replacing Cx with a piece of coax cable terminated with a variable capacitor (Ct) makes for and easy to reach adjustment. Be aware that the cable capacitance has to be added to the found optimum value of the trimmer at the end of the cable. This then becomes the value of the fixed capacitor, so Cx = Ct + Ccable. If you can’t get a SWR of 1, change C a small amount and then carry on using Lx and Cx. Every change in the output filter in the anode circuit will influence the input SWR. Make sure the output is tuned for maximum output power into a suitable 50 Ohms dummy load. Take especially care on 10 m, a power difference of 50 W can make the input SWR more than 1.5! In this amplifier 10 and 12 m share a common input filter as well as 15 and 17 m. To get a good compromise on all four bands Cx has been made up out of 2 plastic trimmers («fig). The original fan can be lubricated, and I recommend doing this frequently. I find the cooling it provides sufficient, even during tests using the raised anode voltage. I do make ample breaks to let things cool down. Although I don’t use the amp a lot, or only for short periods, I have been trying to blow the air from underneath the valves with a small 12 V fan, mounted using double sided tape next to one of the valves (fig). After that I tried mounting it lying down next to the original fan, this worked fine except on 15 m, where it slowed down due to RFI interference. In the end I settled on a PC fan (60×60×25mm) mounted on 2 small brass lugs soldered to the motor of the original fan. Power is supplied («fig) through rectifying and doubling of the 6.3 VAC filaments supply. Please note that the positive and negative poles are floating. This is an easy way to mount the assisting fan without a lot of mechanical work and is quite adequate for normal use. If you plan on using this amp a lot and for long periods at a time, it may be better to place a bigger fan on top of the cabinet above the valves, to assist in getting more air through. That is the most effective and easiest way to achieve this. There are articles on the internet showing the original fan being replaced by a more powerful 120 VAC type in the same place, or a similar 12 V type. Harbach Electronics has replacement wafers for sale for about $30. 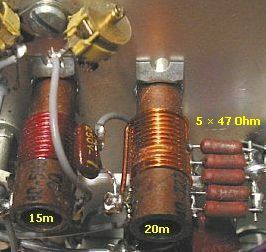 These can be used to add 2 extra bands, such as 30 and 160 m, to this amplifier. This company also has various other interesting parts for the SB-200, such as a soft-start module, a better fan, electrolytic capacitors, etc. In the past years I have only bought CETRON second hand valves, they all have proven to be very satisfactory in my power amps. Only once («fig) I received a 572B with a loose base and failed vacuum. These (Chinese?) CETRON valves have a hard life during my extended experiments, and many tests, but they never fail. These are really rugged valves and extremely well suited for homebuilt linear amplifiers. The table (fig») lists the specs of the valves, as far as I can tell these are applicable for ICAS applications. The table («fig) shows that the maximum drive for 2 valves is 60 W. In practice there are all kinds of losses (way of construction, mounting, and components) and this 60 W can be not enough. 100 W from a driver will probably deliver 60 W effective to the valves, but whether you are over-driving them or not can only be really assessed using a scope. Other manufacturers specify a max drive of 60 W per valve. 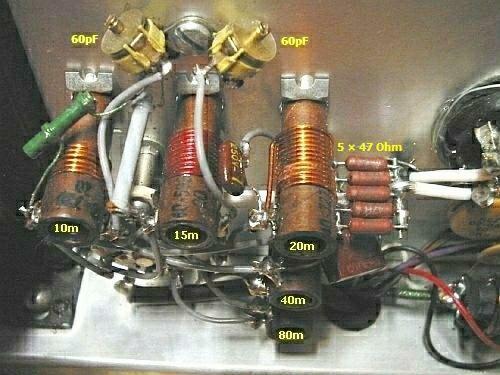 In a lot of amplifiers collapsing of the anode voltage at full drive prevents the maximum output power being achieved. 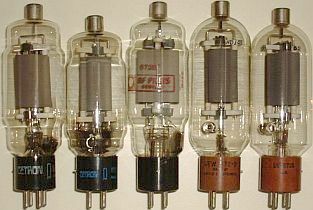 The valves made by various manufacturers are not all of the same length (fig»), This can sometimes lead to problems when replacing a valve in a particular amp. All valves in the photo vary in length. The 2 left-hand units are made by CETRON, the middle one by RF-Parts and the 2 right-hand units are a UEW-57-B and a UE-572B by Waters Electronic Company. All these valves, as well as all my other 572B’s deliver the same output when fitted in this amplifier (using a 10 Ohms feedback resistor). The inputs also remain unchanged. In my experience, not only with this but also with other amplifiers, it is not worthwhile to get 2 matched valves. Cetron & Svetlana, take notice of the smaller plate of the Svetlana's 572B! A reduction of the quiescent current can be an indication that the emission of one or both valves is reducing. At the same time the SWR between the driving transceiver and the amp will raise. Driving the amplifier ‘key-down’ till one of the valves turns red indicates which one is degrading. The worst valve will not be so red as the good one. The Svetlana 572B was designed for AF applications and the plate is of smaller size than that of other makes, therefore I do not advise to use the Svetlana's.